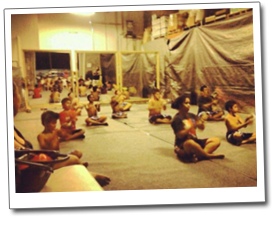 Mauga Mu home of the world reknown Samoan fire knife dance champion, Mikaele Oloa and his family! Mauga Mu is a name that is spreading like fire with its growth in multiple locations throughout O'ahu and its popularity beyond the Pacific. LEARNING THIS DANGEROUS DANCE MUST BE DONE UNDER THE SUPERVISION OF PROFESSIONALS! Mauga Mu is open for all ages. This club is led by Mikaele's father and teacher, an award-winning fire knife dancer himself, Isitolo Oloa. All instruction is done under the supervision of the Oloa Family and should be taken very seriously. This is definitely a dance that needs hard work, dedication, focus and caution! Mauga Mu is a fierce competitor in the World Fire Knife Dance Championship at the Polynesian Cultural Center and have competed and placed in multiple Samoan Fire Knife Dance Competitions World-Wide. Meet the Mauga Mu Crew!